Several countries from the former Yugoslavia have topped European capacity growth for the 2019 summer season, which began yesterday. During the second quarter of this year and the first half of summer, Croatia will see the biggest increase in available seats within the former Yugoslavia, followed closely by Macedonia, Bosnia and Herzegovina, Montenegro and Serbia. All five have made it into Europe's top fifteen fastest growing country markets for the second quarter of the year, according to the airline network and analysis portal "Anna Aero". The British overseas territory of Gibraltar will see the biggest increase in capacity when compared to last year, followed by Albania, Ukraine, Georgia and Austria. Croatia will register a 15.2% increase in year-on-year capacity over the next three months. Growth has been fuelled after numerous carriers brought forward the resumption of their seasonal flights to the coast, in addition to the use of larger aircraft on existing routes and the launch of new services. Overall, Croatia's nine commercial airports anticipate handling over eleven million passengers this year. The growth in available seats will be followed by Macedonia, which will register a 13.5% increase in capacity. Wizz Air, which is in the process of introducing eight new routes from Skopje and Ohrid airports, will bring an additional 200.000 seats onto the market. As a result, the low cost airline will have over 1.9 million seats on sale to and from the country this year. Bosnia and Herzegovina's capacity growth will amount to 11.1%. The increase in the second quarter will come as a result of Ryanair's flights to Banja Luka Airport, as well as increased aircraft movement in Sarajevo. Montenegro will boast a 9.7% year-on-year increase in capacity, making it the eleventh fastest growing market, between the Faroe Islands and Belarus. Serbia, which will see the bulk of its summer capacity growth during the third quarter, is set to register a 7.1% increase in available seats during the second. Belgrade Nikola Tesla Airport is targeting 6.2 million passengers this year, while Serbia as a whole should reach at least 6.6 million travellers, the country's Deputy Prime Minister and Minister for Construction, Transport and Infrastructure, Zorana Mihajlović, said recently. Well Adria's problems didn't help. Well Ljubljana needs to bring in new airlines. Their entire growth (and demise) over the years has been completely dependent on Adria. The real question is why is Wizz Air so slow to grow in LJU. They had the same schedule for ages now. I think they should try Vienna or something else in the west. Vienna is too close for an A320. LJU should realistically be ahead of SKP and PRN yet it is completely stuck. I agree. It is sad that airports like Skopje and Pristina are handling more traffic than Ljubljana... The Ljubljana airport should really wake up. I really wish they would. Not sure why is sad that SKP or PRN is handling more traffic than LJU? Is LJU entitled to more traffic with some convention which I'm not aware of? Well Slovenia has a bigger GDP, it is in the EU, it has more tourists, it has a national airline... with all of these you would expect them to have more passengers. No offence intended. It goes to show that national airlines are not always the solution for growth and can be counter productive. There is a lot more competition around LJU then around SKP and PRN. Also key European markets are accessible by car and good rail links. Now that the Chinese are going, Maribor should be activated for LCCs. MBX is dead. Nobody wants to go to visit Maribor (comparing to Ljubljana) and LJU is far from reaching capacity. LCCs will come when JP goes bankrupt. Which should be soon. Didn't people write in the comments here how it was going to be a tough year for ex-Yu airport with little growth? Seems like it will be quite a good year. Well generally growth is expected to slow across Europe. Some people here don't seem to get that there is a difference between capacity growth and passenger growth. The two need not go hand in hand. I'm positively surprised about BiH's capacity growth. Sarajevo really should be handling well over a million passengers by now. They just managed to break 1 million last year. +1 SJJ should have around the same number of passengers as Skopje and Pristina or at least be on the same level as Podgorica. All that is required is for Wizz or someone similar to open a few routes and they would be there. Exactly. Take Tuzla for example. Had Wizz opened those routes in Sarajevo instead of Tuzla, SJJ would have an extra half a million passengers, at least. 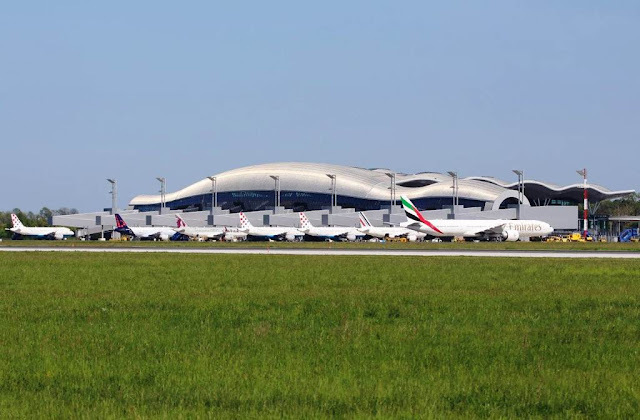 Don't forget that BiH comes second in ex-YU after Croatia in the number of operating airports. The more airports you have, the stronger you will be. If INI gets its new routes then we are most likely to see Serbia up the chart. I am surprised with Bosnia, not sure where is that growth coming from? Only from BL? Also, with Air Serbia going big in Belgrade and many new routes from Nis, I would expect Serbia to be higher. Maybe they did not count Nis routes yet? If you read the article you will get your answer. The capacity growth is for Q2 - second quarter. Like it says for Serbia the majority of the capacity growth comes in Q3 - third quarter. That's when Air Serbia launches its new routes and Nis flights are supposed to start. Bosnia was extremely underserved in the past and they are catching up with the rest of Europe. I wonder where Bosnia would fall on the list if they factored in FlyBosnia's growth. I'm still very skeptical of this FlyBosnia project. Whenever you see some grand plans from start ups they usually fall flat. Maybe they do launch all the routes they have announced, but we will see if they survive or in the end become a shuttle airline between Saudi and Bosnia. @ Nemjee plus if Mostar gets those Ryanair flights it should be quite a year. Personally I think they will soon announce new routes to Banja Luka for next winter. There are no new Nis-routes yet. Percentile growth isn't hard to achieve if your base number is low so the likes of Albania, Bosnia and Faroe Islands on the list is no surprise. Albania has been really growing dramatically this year and last. But is Albania really low? TIA is basically as busy as ZAG. How come no Bulgaria on the list? I thought they were growing like crazy. Exactly. No new routes by Wizz and Ryanair. SOF's turn was in the LCC boom in 2016-2017. Even though VAR will grow significantly this year, it still cannot be compared to the rest. FR is adding some new routes... AQJ, MRS, KBP. W6 has pulled an aircraft last year, ending their expansion in SOF. Montenegrin airports have been quiet achievers these past few years and it seems the trend will continue this summer. I'm really surprised how well they have been doing. I mean who would have thought Podgorica would be handling over a million passengers on an annual level. Well it seems all that was required was for the market to open up to competition. Is there a realistic chance Belgrade will achieve those 6.2 million passengers this year? And how many passengers could Nis handle with those new flights? I think we will have to wait and see how BEG performed in Q1 and then we'll have a clearer picture on what's realistic to expect. I believe the airport will pass the six million mark but the question is by how much. I believe Belgrade will easily handle 6.2 this year. No chance of that happening in 2019. Let's wait and see. You might be surprised. Very good for Croatia. No wonder most of the new routes on the right are to there. Interestingly 100% generated by the coast. OSI is tragic, once Wizz cuts BSL Trade Air will be the only whole year operator. I think maybe the best would be to shut it down same like Maribor. It just can't work. I don't think the route is being cut. I think they are just looking for an alternative aircraft now that the BEG plane will be deployed elsewhere. Yes but it's been a while now that it wasn't changed. Also why stop sales when they can just change dates once new plane is found. If it was any other airport I would be optimistic but OSI is a special case. I guess we will see. Remember how easyjet didn't schedule flights from Geneva to Belgrade last year for months before they put tickets on sale eventually? I'm not saying it's going to happen here, I just find it odd that they are randomly suspending OSI especially since loads were good and they were even discussing introducing London with the management a few months ago. It wouldn't be the first time Wizz is suspending a route because of a lack of equipment. Remember Nis-Malmo? True INI-MMX was brought after three months. Maybe OSI will be back in winter when there is less demand in Europe so they have spare capacity? Did they receive subsidies for these flights? Yes it seems OSI will be back in winter. But you really got to wonder how smart it is to miss the busiest part of the year - June - October. Good summer ahead for most countries. Congratulations. Seems to me more and more that SKP is overtaking PRN this year. PRN has quite good growth too. Remember that the table shows capacity growth for Skopje and Ohrid. Based on the data so far, how many passengers can we expect in Skopje? PRN has really not been affected by Germania collapse. i guess those stories that SKP's growth is largely from PRN can be put to rest. We have other examples of that already in ex-yu - Podgorica/Tivat, Dubrovnik/Tivat. Overall Croatian market performing the best in ex-yu. Yep around 4 passengers per capita! That's probably among the highest in the world. Montenegro has among the largest number of passengers per capita in Europe actually. Bosnia is handling just a couple of thousand passengers less than Slovenia but this year Bosnia will overtake Slovenia. When you look at it from a country level all ex-Yu markets are growing very nicely this which is great news. :D tako je! Slazem se. All the best to all the hard working airports across ex yu. Tako je!!! Bravo Hrvatska i jos vise bravo Croatia Airlines sto Qatar leti Dohu, Emirates Dubai, Air Canada i Transat Toronto, American Philadelphiu, Korean Seoul, more to come soon, a najveci domet flag carriera su Dasinke do Beca, Minhena i Zuricha i pokoji carter sa obale na Airbusu. Ma ne bravo, 1000 puta bravo!!!! Tvoja negativnost je tužna. OU služi kao servis hrvatskim građanima, a ne da transferira turiste u Hrvatsku. Za to služe druge kompanije. Ta Litva nije prošla rat i izbjeglice i sve šta ide uz to. Dobro je da imamo i ovo šta imamo. Malo više pozitive ne bi vam škodilo. Kao da se posljedice rata u maloj zemlji mogu zaliječiti u trenu? Mi nismo imali Marshallow plan kao Njemačka i morali smo sve sami uz neprestane napada ajkula koje su nastojale rastrgati ekonomiju i državu. Zato i kažem da treba više pozitive. Stvari u državi idu nabolje, polako ali ipak. Bitno je da zračne luke uspješno posluju, OU će ispuniti svoju svrhu javnog servisa, u to ne sumnjam. Lijep pozdrav! Stvari u drzavi idu nabolje? Ljudi bjeze glavom bez obzira jer nema buducnosti i perspektive. Na vlasti su ljudi iz iste stranke i istog mentalno sklopa kao prije 30 godina, konkurentnost ekonomije je na zadnjem mjestu u Evropi, industrijska proizvodnja se smanjuje, birokracija ubija i obicne ljude i poduzetnike, ni jedna ozbiljna reforma nije napravljena u 20 godina, posao se dobija uz clansku iskaznicu HDZa i satelita, zdravstvo je u rasulu, pravosudje je krivosudje, pod politickim utjecajem i korumpirano, nema reforme obrazovanja, a Croatia Airlines je samo slag na torti. I na vrhu jagoda. Lijep pozdrav! Tko želi vidjeti negativnosti može ih naći u svakoj državi. Treba raditi na poboljšanju svaki dan i vjerovati u bolje sutra. Tko zeli biti objektivan mora vidjeti i negativne i pozitivne stvari oko sebe. Pozitivna je ljepota Hrvatske, klima, zemljopisni polozaj, raznolikost, kultura, hrana.. . Pozitivno je sto imamo turizam. Da ga nema, davno bi bankrotirali. Negativno je to sto zahvaljujuci pogresnoj politici umjesto priblizavanja Svicarskoj, priblizavamo se Bangladesu. Sto da samo jedne godine iz nekog razloga (npr. terorizam, prirodne katastrofe.. .) turizam podbaci? Raditi na poboljsanju i vjerovati u bolje sutra su fraze, potpuno neostvarive sa mentalnim sklopom spodoba koje obnasaju vlast u Hrvatskoj i onih koji ih biraju. Ne vjerujem da je ljudima u Hrvatskoj toliko loše. Nekima sigurno jeste i ti odlaze potražiti sreću negdje drugo i to je pozitivno. Mediji prenapuhuju negativnosti i mislim da je to po nečijoj direktivi. Stanje nije toliko loše koliko se može čitati po medijima. Inače ljudi ne bi birali vlasti koje već biraju. Pametniji popusta. Hrvatska je najsretnija, najbogatija, najpostenija, najorganiziranija, najtolerantnija, najnaprednija i najpozeljnija za zivot. Ljudi uopce iseljavaju jer im je predobro. Strane agenture i ajkule planski smisljaju kako da takvu idealnu Hrvatsku uniste, iz ciste zavisti, pa onda kroz medije izmisljaju i prenapuhuju ono sto u stvarnosti ne postoji, a Croatia Airlines, sa svojom flotom od 50 aviona, od cega 10 dugolinijskih sirokotrupnih je simbol uspjeha, poslovnosti, i model kojem teze svi, od Aljaske do Singapura. Zivio ti meni sto godina, u sreci i zadovoljstvu, idili i blagostanju kakvo jedino postoji u Hrvatskoj i ponecijoj masti. Bok! Svako dobro vam želim i da puno godina letite našom Croatiom! American increasing DBV Philly from 3 to 4 weekly starting September. Additional flight Saturday from Philly, Sunday from DBV. Service not even started and increasing, especially after the peak season sounds very very promising. And Croatia Airlines, sleep well and have a nice dreams! Pozdrav iz Rijeke - this is an April's fools joke by Avioradar. Don't get how people fall for their gimmick each year. I could right that JU is getting 6 Dreamliners and starting SFO, LAX and NRT flights and people would not only believe it but also accuse anyone who is skeptical about that strategy as a "JU hater". Avioradar claims its not april fools. We will see. Considering the news here, I would not be surprised if it is true. Along with Georgia, the only other markets in the top 15 for Q2 2019 growth that also appeared in the same category during Q2 2018 are North Macedonia (14% growth in Q2 2019; 17% growth in Q2 2018 versus Q2 2017), Latvia (12%; 19%) and Hungary (8.2%; 15%). Thanks for the table. I'm very interested to see Belgrade Airport's growth for the first quarter. Only a few weeks left until we find out. Anyone have an idea how many seats are offered annually to Croatia? Of the countries listed in the top 15, only one appears in the top 15 ranking for most seats, with Portugal being Europe’s 12th largest market regarding total departing seats in Q2 2019. The top markets remain the UK (3.1% growth in Q2 2019), followed by Spain (3.7%), Germany (2.0%), Italy (5.9%) and France (5.2%). Both Georgia and Ukraine are seeing those growth is also related to emmigration. Ukranians are fleeding in flocks to Poland, Baltics and of course Germany. The same goes to Georgians. As for Georgia it is also a very beautiful country with an interesting capital city and also the coast is packed with tourists. Albania is again a combination of both. I read Tirana has improved dramatically and is becoming very touristic. Gibraltar might be related to Brexit with Brits moving there to secure their EU rights. Finally, I would like to say that I was expecting somehow Romania in the list. It is a country with approximately 10 airports but one can easily see how growth has stagnated. CLJ - +3% was 43% in 2017! Biggest decrease is obviously OMR around 49% after FR abandoned the city completely. Georgia's touristic potential is pretty much alike with Serbia, both in the capital and the countryside. Unlike with Serbia it knew to utilize and advertise it to the fullest. Top tourist destination of the region after Greece is Hungary - a plain with one city. Advertisement is everything. Cheap access is the second. Hopefully Serbia will be working on those. Even though Georgia is economically poorer than Serbia, they still managed to develop. QR for example flies 18 weekly from TBS to DOH!! W6 will base a 3rd aircraft in KUT. Pobeda agressively expanding in BUS. Also many new routes will be opened this summer. Georgia and the Baltics must be the example not only for Serbia, but for the entire region, too.